The Biogel Optifit Super-Sensitive surgical glove is the latest version of Biogel's Super-Sensitive surgical glove. 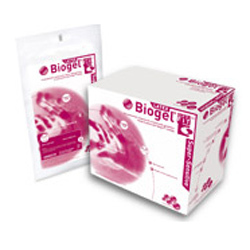 Biogel's Optifit version provides a better fit in the cuff region by preventing the cuff from coming out of place. The Optifit Super Sensitive latex glove ensures the surgical glove is always covering the gown so surgeons are fully protected. With the increased variety of disposable gowns available to surgical teams, not all are ideal for use with surgical gloves which can cause gloves to slip and roll down forcing the clinician to fix the glove's position. The idea of using Optifit surgical gloves is that once you get the gloves on, you don't have to worry about it slipping off. The Optifit Super Sensitive surgical glove is 20% thinner than standard latex surgical gloves. For this reason, the surgeon is able to have higher sensitivity at the fingertips giving better control while handling surgical instruments.